There was a mild drama on board a plane between a Nigerian man and Ethiopian airline officials which caused flight delay. 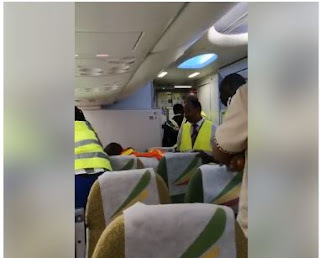 According to Facebook user James Singini, the incident allegedly occurred at Kamuzu International Airport (KIA) in Malawi. It was gathered that the Nigerian man was allowed to pass through immigration at the airport and also allegedly overpowered the police at the entrance. He was later confronted by the airline officials (about three of them) as they struggled to get him out of the plane. The drama was filmed by another passenger as the Nigerian man can be heard shouting ‘help me’ befor he was finally bundled out.